This irreplaceable building, 1 Yorkville — designed by award-winning architect and creative genius Rosario Varacalli — will feature some of Toronto's foremost design, a building that demonstrates considerable creativity in how it is connected within the community. “1 Yorkville will be distinguished from all the other condominium projects in Toronto because of three important factors: preservation, porosity and changing perspectives,” explains Varacalli. The exceptional structure will be built above the fully restored Yorkville Village buildings that date to the 1860s. This meticulous preservation work — overseen by ERA Architects, Toronto's premier heritage specialists — will involve the retention of not just the graceful historical facades but the entire original structure of the 19th century buildings. This is where the condominium’s boutique retail offerings will be housed. 1 Yorkville is also about changing perspectives, with a magnificent tower that's clad in what Varacalli describes as "3D wallpaper" — a facade that creates dramatic changes in light, shadow and colour based on which direction the building is being beheld from. "It will always appear as though it's changing, depending on the time of day, light, or direction," says Varacalli. This is not the first time Bazis and Plaza have joined forces. Previous partnerships between these stellar developers resulted in the creation of two of the Toronto's most successful and architecturally inspired residential condominiums: Exhibit on Bloor, an exceptional and striking building located right across from the Royal Ontario Museum, and Emerald Park, two dramatic condominium towers at Yonge and Sheppard that have taken North York design to an entirely new level. "We're pleased to be once again partnering with Plaza on the development of this irreplaceable condominium for Toronto," says Gold. "With the combination of our collective expertise and experience, augmented by Rosario's unparalleled eye for design, 1 Yorkville will raise the bar for indulgent living in this world-class city." 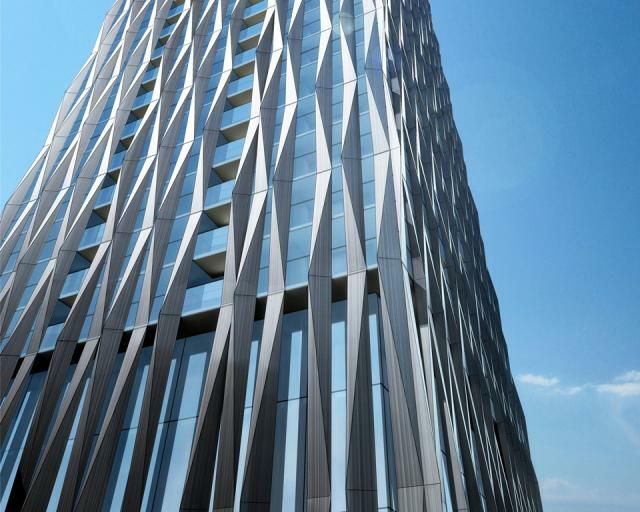 For continuous updates about this project and to be among priority purchasers, please register at www.1yorkville.ca. Topping Off: UrbanToronto's Hottest dataBase Files of 2016!